In the time it took Boeing and the US Marines to develop and put into service the Osprey tilt-rotor helicopter, Italy's AgustaWestland has lingered over development of its own, smaller tilt-rotor, prompting questions about the fate of the program. 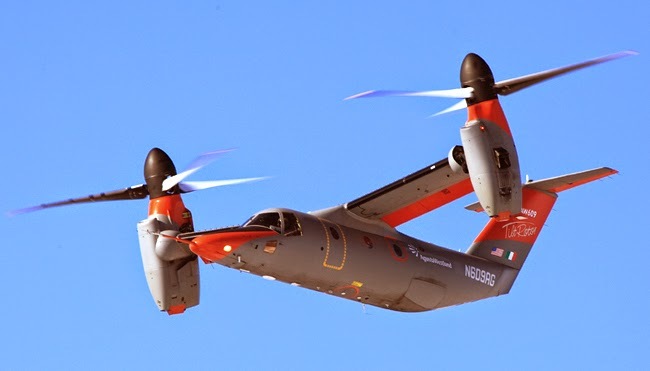 Initially developed in partnership with Bell, the AW609 has racked up test flights and turned into an all-Italian program after the US firm went its separate way. But now, there's new interestin the aircraft by the Italian Navy and Army as both look to tilt-rotors to boost capabilities. Strategy documents issued in recent months by the Army and Navy listed tilt-rotors as high on their shopping lists, just as AgustaWestland announces a series of planned upgrades for the AW609. On March 3, the Italian firm said it was planning to increase maximum takeoff weight to 18,000 pounds thanks to engine upgrades, landing gear modifications and better flight control techniques. In short, the firm said, the AW609 would now be able to fly 500 nautical miles in two hours carrying nine passengers. The firm also said it was working on placing extra fuel tanks under the wings to boost maximum range to 1,100 nautical miles, or allow an 800-nautical-mile flight with six passengers in just over three hours. The cabin door is also being enlarged to help the AW609 qualify for a search-and-rescue role, and a Rockwell Collins Pro Line Fusion flight deck is being added. AgustaWestland said it was aiming for FAA civil certification in 2017. 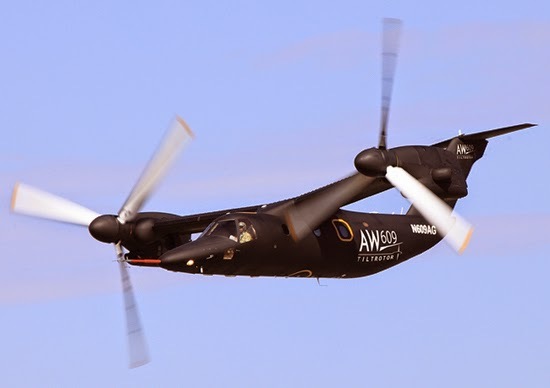 The firm sees the AW609 as ideal for oil and gas rig flights, and on March 19, Mauro Moretti, the CEO of parent company Finmeccanica, said the aircraft would prompt a "revolution" in the market. Meanwhile, the Army and Navy are eyeing the aircraft. Last November, the Navy issued a strategy document that identified the tilt-rotor as a key future acquisition. "It is a way to obtain capabilities that the Navy has been denied due to its small size," said one official. "With a tilt-rotor, you have an increase in the projection of troops and material, as well as an increase in the sustainability of vessels at sea, giving a small Navy operational possibilities it would not have otherwise," said the official. "It's the piece of a jigsaw we have never had." Thanks to its range, speed and altitude, a tilt-rotor could provide other capabilities a shipborne helicopter could not, the official added. "One possibility is as an early warning platform, which could see farther than a helicopter thanks to its higher altitude," he said. "Or as a refueling platform for STOVL joint strike fighters." Navy officials have looked at the AW609 as well as the Osprey, with Marine Ospreys making landings on the Italian carrier Cavour. "Companies are now looking at how to solve the problem of hot exhaust from tilt-rotors damaging flight decks," he said. "One solution they are considering is way to use gearing to allow the engine to remain fixed as the rotor changes position. Then the exhaust can be directed behind the tilt-rotor at all times." In a strategy document released by the Army, planners called for development of a family of tilt-rotors from 8 to 14 tons, including an 8-ton version for six passengers for transport, evacuations and an aerial command post. A 14-ton version could then be developed to fly 15 passengers or a load of 2.5 tons. The document goes on to describe the planned development of a family of tilt-rotors for dual use ranging from eight to 14 tons. "A first aircraft of eight tonnes for six passengers would allow the rapid transport of personnel and material, host an aerial command post," and carry out medical evacuations, the document said. "The tilt-rotor in the lightweight configuration would be able to extend dramatically the range and speed available for liaison, medevac and command post missions," said an official. An Army tilt-rotor might add a chin-mounted machine gun for self-defense and a targeting radar, he added. Given the common interest by the Army and Navy, the Army official said that shared development of requirements could be considered.